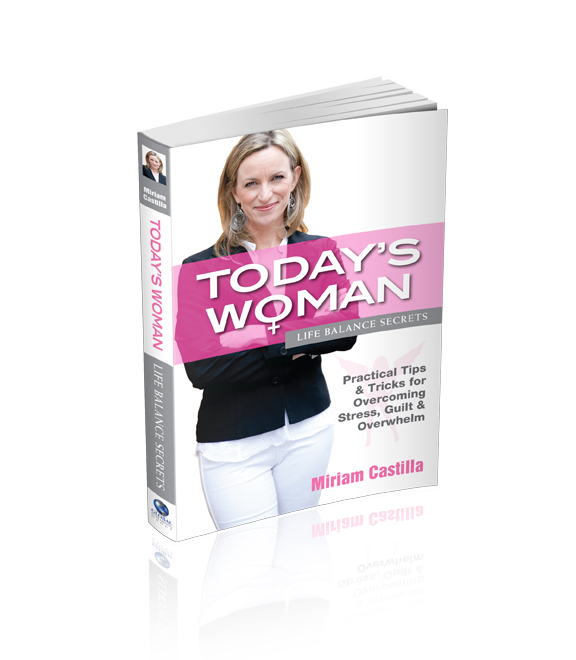 Miriam Castilla is an International Author & Speaker who inspires self-reflection and offers her audience highly practical take-aways. Known as THE EFFECTOLOGIST, Miriam Castilla’s passion is saving people from the sea of overwhelm they find themselves in – helping them get unstuck and move forward with confidence. Her focus is on restoring life balance and reigniting passion with a unique inside-out approach she calls EFFECTOLOGY. By showing her audience how to leverage the 3 critical keys of Clarity, Focus & Strategy, she helps them achieve massive shifts in personal effectiveness and discover the limiting beliefs that have been keeping them trapped. “The key is to have absolute clarity on WHAT you want and WHY you want it in the first place,” she says. Miriam warmly engages her audience as she openly shares her personal story. Starting out on the corporate fast-track as a Chemical Engineer and Corporate Analyst, she later found herself financially struggling as a single mother of two young children. By implementing the strategies she shares with her audience, she went on to build an award winning business in a new industry, become a bestselling author, successful entrepreneur, keynote speaker, business mentor and is proud to be the first Certified Trainer personally trained by NY Times bestselling author Mike Dooley to teach his powerful Infinite Possibilities program in Australia. Miriam has been featured and quoted in national and international publications, twice nominated for a Telstra award, co-founded an internet start-up, a business support group, run an online retail store and import business and never shys away from a challenge or opportunity. “Today’s Woman – Life Balance Secrets: Practical tips & tricks for overcoming stress, guilt & overwhelm”. Miriam Castilla is a breath of fresh air and a motivational speaker who more than just inspires. By drawing on her Engineering background, she creates vivid imagery and tangible analogies, gifting her audiences with simple, practical strategies that create massive shifts and tangible results. I have been lucky enough to see Miriam Castilla present several times now for all-female audiences. She has such a calming yet professional style that I could listen to her for hours. Miriam ran her Money MO course for our exclusive Property Women members. Her understanding and knowledge was spot on. I found myself nodding along and recognizing my own behavioral patterns around money. This talented lady included a meditation session at the end with some really interesting revelations – all the feedback has been really positive. If you get the opportunity to see Miriam present, jump on it – it might just be life changing. The 2015 International Rural Women’s Conference was fortunate to have Miriam Castilla as a panelist. Miriam spoke with honesty, compassion and empathy as she shared her leadership journey with the international and national delegates. Miriam is an interesting, intelligent and accomplished speaker who has the ability to engage her audience as she weaves the inter-relatedness of leadership and finance by challenging us to believe in ourselves and take charge of our own lives. We gained much from listening to Miriam. Her skills and knowledge were much appreciated. Miriam was a sensational speaker at our recent Leadership Academy. She engaged a room full of passionate entrepreneurs throughout her thought provoking, practical and inspiring presentation. Attendees walked away with the necessary skills, tips and advice on how to become successful in their businesses and the wider community. She also skilfully enabled participants to reflect on their own personal goals and move forward confidently after the event was over. Miriam’s relatable and authentic speaking style appealed to her target audience. Miriam also recently traveled to San Antonio Texas to speak at Mike Dooley’s Train The Trainer Conference, has delivered keynote addresses at the New Venture Institute, The AIESEC National Conference & Sass Summit. She has twice been nominated for a Telstra award and for many years volunteered her time as a Speaker in Schools for Advantage SA as she loves delivering her message and making a difference in people’s lives. Smash through the limiting beliefs & patterns that are keeping you stuck. The 3-step process that transforms uninspired customers into loyal & enthusiastic fans. Six simple effectiveness tools to free up a day a week for you!